Art- Plein Air Painting Festival Painting Huntington Beach is a new art event, a Plein Air Painting Festival that involves painting in Huntington Beach is a juried exhibit of outdoor painting by local artists. All paintings are created outdoors in scenic locations throughout Huntington Beach during the dates of September 10th to 24th. Paintings are exhibited and offered for sale from September 24th through October 1st. This fundraising event helps promote special programs offered at the City of Huntington Beach's Huntington Beach Art Center located on Main Street between 5th Street and Acadia Avenue. 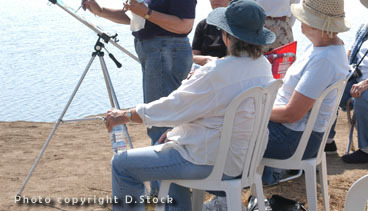 Pictured above is artist Diana LoSchiavo painting a watercolor in a demonstration held at Huntington Beach Wetlands during the Plein Air Painting Festival. The Huntington Beach Art Center - The Center presents the first Plein Air Festival: Painting Huntington Beach. Artists will spend the next week painting in various outdoor locations, capturing some of the most stunning vistas in the city. Selected through a jurying process, the participating artists will meet for the first of three workshops included in the Festival on Tuesday, September 13, with renowned artist Jerry Owens near the Park Bench Caf'at beautiful Central Park. The second workshop will be held on Thursday, September 15, at the Bolsa Chica Wetlands with artist Diana Lo Schiavo. The third will be held at the Art Center's studio with Milford Zornes on Saturday, September 17. All workshops are scheduled from 9:00 a.m. - 12:00 p.m. The public is invited to meet the artists at a reception on Saturday, September 24, from 6:00 - 9:00 p.m. The Festival culminates with an exhibition and sale of works, which continues until September 30. Join the fun! Catch the artists in action at one of your favorite spots. Other recommended painting locations include the HB Pier and shoreline, the Equestrian Center, the Hilton and Hyatt Hotels, Lake Park, and Main Street. Call the Art Center for additional information at 374-1650.